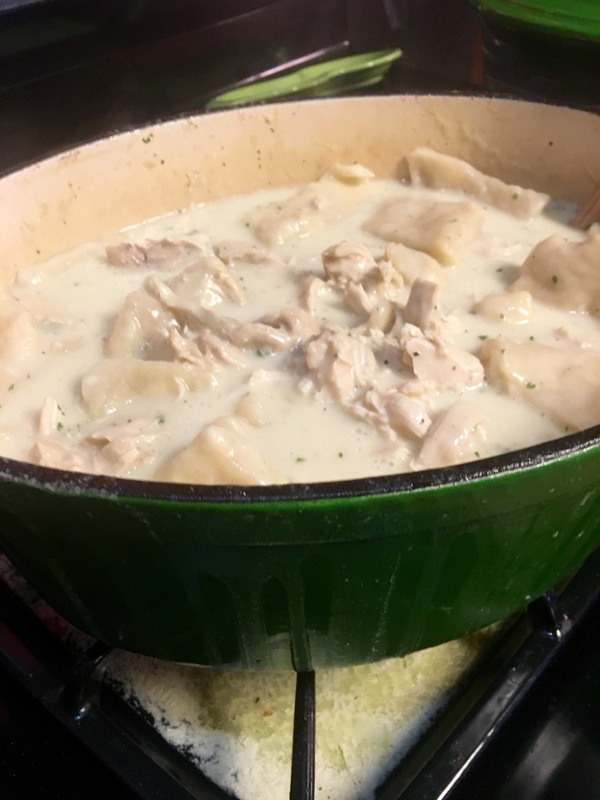 VINTAGE RECIPE: My Great Aunt Ellen’s Chicken and Dumplings- MY VERSION!! Basically, I just dumped it all in a pot on high- when it reached a full boil, I covered it and let it cook on low for an hour. After, I plucked chicken breasts out and chopped them into small pieces. I strained the broth and discarded the solid vegetables. Then, I measured out about 2 to 2.5 quarts of the broth for the ‘sauce’ later. Aunt Ellen’s granddaughter warned me to test out the recipe before totally committing, as her grandmother had different variations of the same recipe floating around. I immediately noticed that the baking powder to flour ration was WAY too high and would have resulted in a very bitter product. I increased the flour to 2 cups and decreased the baking powder to 1 tsp. 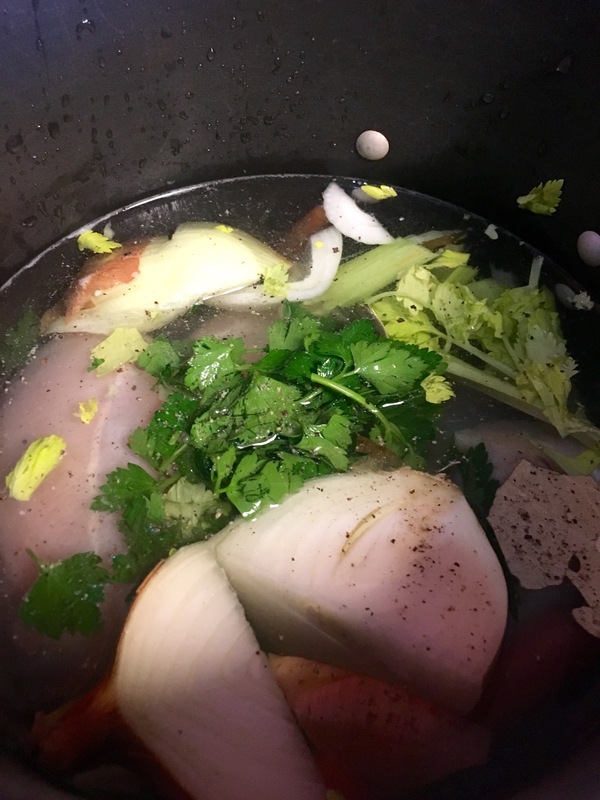 I also added 1/3 cup of lard (or crisco), as it makes for a more tender dumpling and can be found in most chicken and dumpling recipes online. When I experimented WITHOUT the fat, it didn’t taste as good. after, I added the milk and just mixed it all up with my hands. Next time I will use my stand mixer- I then made the dough into a smooth ball. Melt stick of butter in pot over medium-high. Add flour and cook for a minute. Slowly add the cream and milk, a bit at a time, stirring until it becomes a white cream gravy. Add the 2 quarts of chicken stock and adjust seasoning. 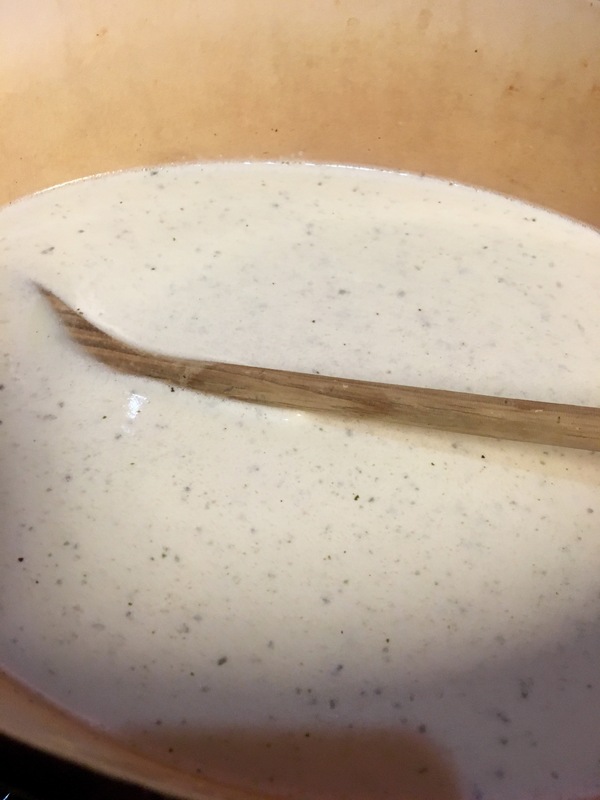 If you worry about lumps, use a stick blender or whisk while incorporating the broth. Return to a boil, stirring constantly. When it begins bubbling again, add most of the dumplings and cover. Lower heat to low and cook about 12 minutes. Add rest of dumplings and cook uncovered on medium for about 20 minutes. Keep a close eye on it or it will boil over (like mine did). Add chopped chicken and cover, set heat down to low, until warmed through. This is definitely a keeper. I have to admit, I’ve never eaten real chicken and dumplings before. The only other exposure to it that I had was Pennsylvania Dutch Chicken Pot Pie and the stuff that comes out of a can (yuck). I was truly impressed with the delicate flavor. I can see why my father loved it so much. This breakfast (Maisie and I shared) was made entirely with jarred black European truffles. 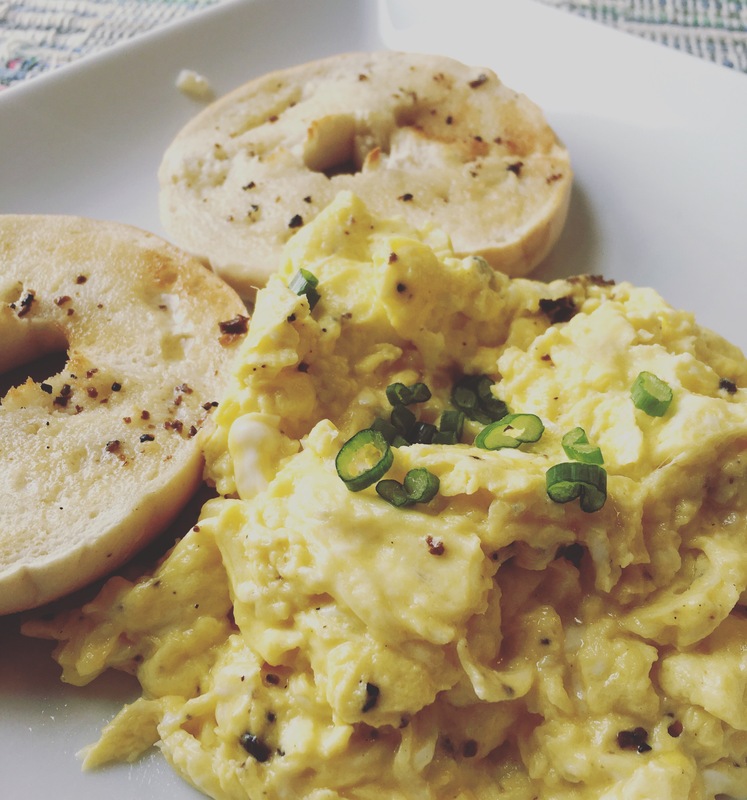 Super simple- toasted bagels with black truffle butter and scrambled eggs with black truffles. I made the truffle butter by mixing half a stick of unsalted butter with quarter of a stick of salted butter and added a tsp of the minced black truffle. The third time’s a charm- found a nice egg pasta- FINALLY- that was perfect for this dish. My folks enjoyed their pasta and truffles… after this, I had a huge white truffle left to use up and I suddenly found myself sick to death of pasta. Putting an egg in the fresh truffle box is OMG DELISH! I put an egg in the container I used to store the truffles… and it was probably the wisest thing I’ve ever done with these mushrooms. When I scrambled it, the thing smelled and tasted more like truffle than the truffles did! Raw, it is VERY strong and pungent- however, once warmed lightly in a pan of butter for a few moments, it mellows out to a more agreeable and subtly luscious form. My second experiment was a pasta dish. It was a huge hit with everyone, even the truffle hating Man. I read somewhere that Oregon white truffles should be treated more like the European black ones- slightly warmed so that their true flavor shines through (and to temper the sharpness that they have when raw). I threw a knob of butter in a pan and warmed it over low heat- then added shaved truffle slices- HEAVEN! It completely changed the flavor profile. While the truffles were warming, I boiled the noodles. I asked R to buy pappardelle, but he brought homemade German wide egg noodles back instead by mistake. It wasn’t a bad substitute and actually tasted better than the last batch of pappardelle noodles I bought. I drained the cooked noodles, threw them back in the pot- added a splash of heavy cream, a small handful of good parmesan, the truffle-infused butter… omg! PERFECTION! I shaved more raw truffle over my plate when serving and LOVED the contrast between the cooked and raw flavors. R isn’t pleased with the pasta quality, so today we are going to hunt for better quality noodles for today’s batch (I am making some for my parents). I received my 1 ounce order of Oregon whites from oregonmushrooms.com. It was sent overnight via FedEx and arrived this morning. Oregon white truffles are weird. They are not quite like their European cousins. They look like truffles, they have a very pungent scent like truffles do. After those basic comparisons, the differences in taste/smell are immense. 1. They don’t SMELL like ‘regular’ truffles. They have a smell that is very chemical-ly. Kind of reminiscent of Tarn-X and garlic and sweat. A lot of people complain that truffle oils have synthetic chemicals in them to mimic the flavor of real- no synthetic truffle oil can out-chemical the scent of these things… not that it’s entirely a bad thing. It’s hard to describe and sounds worse ‘on paper’. They hold their own, I will say this much. 2. The experts say to NOT put them in uncooked rice/eggs when storing them (unlike regular truffles) because it leeches out the moisture. I put one of my 3 truffles in with the eggs and rice and left 2 in the brown paper bag. I shaved off a few slivers for our breakfast this morning: scrambled eggs with white truffles. The three or four thin slivers were almost too much for the three eggs that I scrambled. I loved them- Maisie loved them- R did not. He found the chemical scent off-putting. I still have most of the 3 truffles left… later today I am doing a pasta with Oregon white truffles. I decided that I will warm some of the truffles in butter before tossing with the pasta- as well as shaving some straight onto the top when serving. I will continue the updates- stay tuned!